The Basement Tapes, recorded in the summer of 1967, was a loose collection of material born of Bob Dylan’s seclusion following the burst of manic creativity that produced Bringing It All Back Home, Highway 61 Revisited, and Blonde on Blonde. It was also the product of exhaustion and a self-imposed exile following a motorcycle accident and/or a bout with drug addiction. The songs turn away from surrealism and psychedelia, finding their wellspring in what we would now characterize as roots music – the country blues, hillbilly tunes, and murder ballads recorded in the 1920’s and 30’s, but which reach back beyond the advent of the phonograph. The Basement Tapes trickled out on publishers’ demos and bootlegs before being officially (and only partially) released on a double album in 1975, an album for which Marcus wrote the liner notes. Some of the material such as the gnomic and dirge-like “I’m Not There” have only recently seen the light of day on official releases. A definitive release of these sessions is long overdue. Invisible Republic includes analyses of individual songs from the Dylan album wrapped up in an almost impenetrable mythologizing prose. There is also a fascinating long digression on the Virginia coal miner Dock Boggs, who abandoned his short musical career during the Depression when record sales slumped and his God-fearing wife gave him an ultimatum to put aside the Devil’s music, only to pick it up again 30 years later in the heyday of the folk revival. The centerpiece of the book, however, is a chapter on the magico-illuminatus Harry Smith, who compiled the Anthology of American Folk Music as if he were preparing an alchemical treatise, complete with Renaissance woodcuts and a numerologically significant ordering of tunes. Smith’s Anthology remains, as it was in Dylan’s youth, a powerful talisman, a unique undertaking for its time which rescued dozens of country blues and murder ballads from oblivion just as upstart rock and roll was gaining its first footing as the latest iteration of Satan’s music. Anyone paying attention to Dylan’s output, especially over the last 15 years or so, will find the source of many of his best lines and imagery in the Anthology. To put it bluntly, Dylan has sampled those old 78s to a fairly astounding degree, weaving new cloth from old, and preserving therein the vernacular of a fascinating, bygone era of American folk tradition. Marcus’s first book, Mystery Train, although a bit dated at this point, was a thoughtful and readable placement of rock and roll into its American context. (I still have a photocopy of the Robert Johnson chapter tucked into my King of the Delta Blues LP.) The great weakness of the present text is that Marcus over contextualizes the material, laying a too heavy burden on both Dylan’s Basement Tapes and their antecedent folk tunes by pushing them too hard into a mold of Americanism going back to the Massachusetts Bay Colony and the sermons of Jonathan Edwards. His writing is maddeningly oblique and top-heavy by turns, sacrificing clarity in pursuit of a grand idea. Still for fans of old-time Appalachian mountain music and the soundtrack of (in Marcus’ memorable if overexposed phrase) “the old, weird America”, this is essential reading. Note: Link below is to the more recent edition of the Marcus book, retitled The Old Weird America. 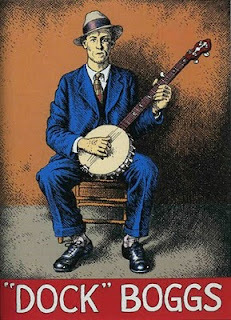 Dock Boggs trading card by R. Crumb.